The world's population is forecasted grow to 9.1 billion by 2050. Water demand will increase 55 percent from current levels, and 40 percent of the world's population is are at risk of suffering from water shortages*. It is crucial, from the perspective of corporate risk activities, to face head on the various challenges posed by the rising population and need for water, and the deterioration of water resources. Water is used in painting and other car manufacturing processes. Therefore, it is imperative that we reduce the impact on the water environment to whatever degree possible. Our strategy is twofold: thoroughly reduce the amount of water used, and comprehensively purify water and return it to the environment. We have implemented various initiatives such as collecting rainwater to reduce industrial water usage, cutting water usage in production processes, recycling wastewater to reduce amounts withdrawn from water sources, and returning high-quality water to local environments. Going forward, we will undertake measures that have a positive impact on local water environments, taking into consideration local communities and water-related issues. The planet Earth, two-thirds of which is covered by water, is often referred to as the "water planet." At a glance, it would appear that there is an abundance of water. However, water is now referred to as a scarce resource, and this water crisis has been consistently recognized as a global crisis by the World Economic Forum (Davos Forum) since 2012. When it comes to water, businesses face a myriad of challenges, including water shortages, water pollution, and natural disasters such as flooding. Additionally, businesses must manage regulatory risks relating to taxation and effluence regulations. Water issues are characterized by substantially uneven spatial and temporal distribution, necessitating regionally coordinated risk management. To identify water risks in each region, Toyota uses regional databases and information and assessment tools provided by the WWF, WRI, WBCSD,* and other organizations to assess the impact on water environments based on operating data and other plant information. Toyota continuously gathers data on water so that we can respond flexibly to changes caused by climate change and address regional issues by taking measures to reduce water consumption and improve water quality. We respond to stakeholders (including customers, employees, investors, local communities, and NGOs) with interests in water issues, and consider access to clean water and sanitary facilities a fundamental human right and provide them to all employees. Toyota also proactively works in collaboration with and discloses information to stakeholders. We are working to enhance interactive communication with local communities by conducting conferences, plant tours, and other programs, and disclose information through CDP Water and other such programs. Although water-related issues and measures differ depending on the region, Toyota established the Toyota Water Environment Policy to achieve the goals of our water environment challenge on a global level. Under the Toyota Water Environment Policy, we are assessing our impact on water environments and working to minimize those impacts from two perspectives: the input side, where we are taking thorough measures to reduce water usage, and the output side, where we are taking comprehensive measures to purify water. We take action from three directions-the pursuit of environmental technologies, community-based operations, and cooperation with society-and strive to be the region's leading plant linked to regional prosperity. 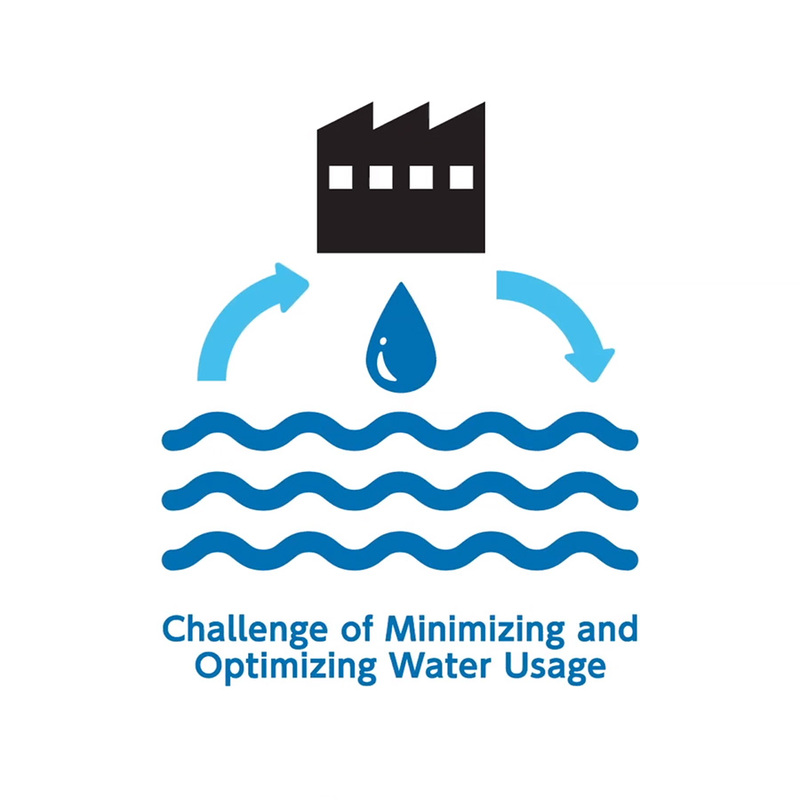 To reduce water usage in our production activities, we have been working to introduce innovative technologies alongside planned upgrades to our production lines, and to conduct daily measures to reduce water usage. In FY2018, our total water usage was 10.3 million m3 (down 3.2 percent year-on-year). Water usage per unit produced was 4.0 m3 (down 7.6 percent year-on-year). 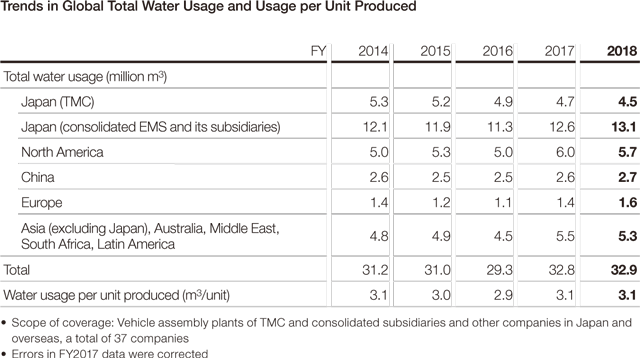 Globally, Toyota is steadily implementing measures to reduce water usage according to the actual water environment in each country and region. In FY2018, total water usage rose to 32.9 million m3 (up 0.4 percent year-on-year). Water usage per unit produced was 3.1 m3, up 1.2 percent year-on-year. To reduce water usage, the karakuri technique was employed to develop a system that separates rainwater. To reduce water usage, TMMT, an affiliate in Turkey, introduced a cooling system that uses low-temperature municipal water and discontinued the use of cooling towers. To clean water and return it to the environment, a nickel- and phosphorous-free treatment agent and other technologies were developed, and a membrane bioreactor system and advanced treatment technology were introduced.